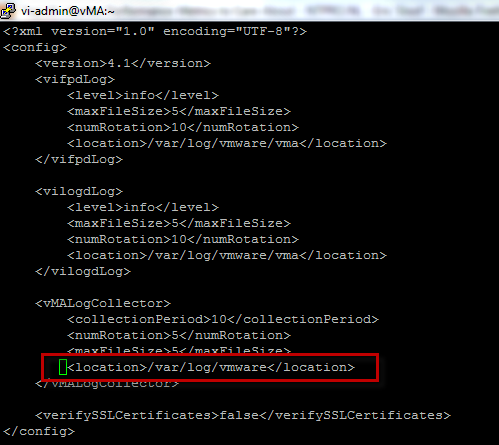 This question pops up from time to time on the VMTN community forums on how to increase the size of /var/log on vMA. 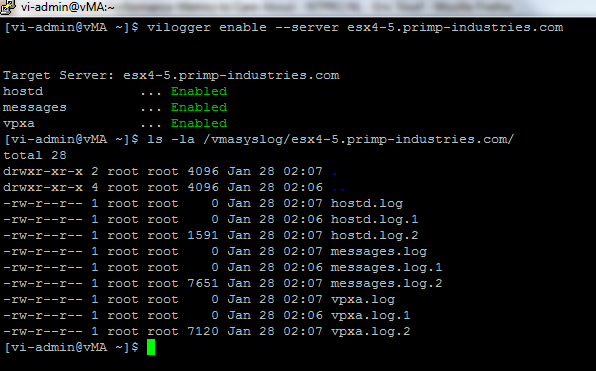 By default, the /var/log partition is configured to ~500MB, which is a decent size for system logs, but one of the features of vMA is vilogger which adds a syslog capability for your ESX and ESXi hosts. This allows you to ship all your host logs over to vMA, the problem is the logs are also stored in /var/log along with vMA's system logs. If you are managing several dozen hosts, you can easily fill up this partition using the default configured size. With vMA 4.0, it was pretty trivial to increase/resize partitions within vMA using LVM and I had written a quick guide on how to do this - How to increase/resize vMA Disks. With the release of vMA 4.1, VMware kind of went backwards and decided not to leverage LVM and lost the benefits with using a volume manager. Resizing the partitions can still be accomplished but it requires a few additional steps and tools. I will show you two methods in which you can increase your /var/log partition, primarily to accommodate larger number of hosts to utilize the vilogger functionality. First, you will want to shutdown your vMA host, you may also want to backup any scripts/configs you may have on your vMA host in case you make a mistake and can not recover. Next, you will need to increase the existing virtual disk, by default it is configured for 5GB. In this example, I will increase the disk capacity to 10GB bringing the total to 15GB. You will also need to download a gparted live CD ISO, in this example I am using gparted 0.3.4-11, it is what I have available on my datastore. Next, you will want to attach the gparted ISO to vMA, you probably will need to add a CD-ROM drive since vMA does not come with one by default. Once you power vMA on, you will need to hit ESC to and select boot from CD-ROM. You should be able to just accept all the defaults and once gparted is loaded, you should see the following screen or something similar depending on the version of gparted you are using. As you can see, it is the partition layout of your vMA host including the unallocated space, which in this case is 10GB. At a high level, we need to resize the partitions inside the extended partition first before we can resize /var/log partition. First you will select/highlight the "extended (/dev/sd4)" partition which is colored in baby blue color and you will move the right arrow and extend it all the way to the right and then click "Resize/Move" button. Next, you will select/highlight "/ (dev/sd5)" partition which is colored in blue. Here we want to keep / (root) the same default size of 3.39GB, so we are just going to shift the entire box from the left to far right. You just need to bring the cursor on top of the dark blue section and drag it to the right. Make sure you do not move the left or right arrows, else you will be changing the size of root which is not what we want. Once you have it like the picture below, click on the "Resize/Move" button. Now you will select/highlight "extended (/dev/sd4)" partition again and you will move the left arrow and drag it towards the right like the picture below and again click on the "Resize/Move" button once you are done. At this point, your screen should look like the following, if it does not for what ever reason you can "undo" all the changes, since none of these changes take affect until you apply them. Now, we will finally increase the size of "/var/log (/dev/sd3)" and consume the full amount of space that we have allocated. Once you are done, we are now ready to apply these changes, the "apply" button is at the top. After this, it can take up to several minutes depending on your allocation but if everything went well, you should see this success screen at the end and you just need to reboot the system to see the new changes. One your vMA host is up, you now should be able to run "df -h" again and you should see that /var/log has now increased with the additional space we assigned it. If you did not want to go through the process in option 1 and just want to add another virtual disk and dedicate that for vilogger syslog, you can actually change the path of the logs in /etc/vmware/vMA/vMA.conf. You can control not only the vilogger syslog but also vi-fastpass logs and vilogger daemon logs, but we will only change the "vMALogCollector" which is basically the vilogger syslog component. I will assume you already have a disk added to vMA and you have created the appropriate mount point (If you are unsure how, do a search online). In this example, I have a 15GB partition in /vmasyslog that I will use as the new home for all my vilogger syslog files. After you have made the edit to vMA.conf, you will need to restart vilogger daemon and you will need to use sudo and the service command. This might be of some value to experienced ESXi-v4.1 users, but being new to the product, not only does it make no sense, it’s of absolutely ZERO value.